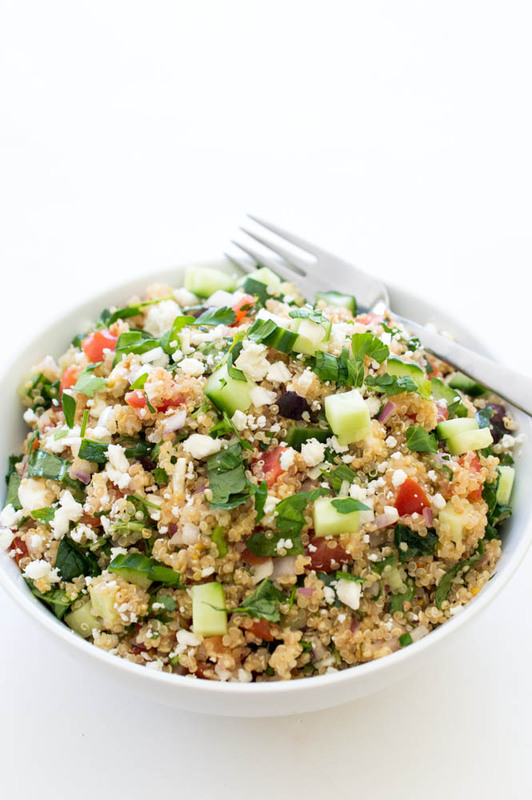 30 Minute Greek Kale Quinoa Salad. Loaded with tons of vegetables and tossed with lemon and olive oil! I have been on a kale and quinoa kick every since I made this Chopped Kale Quinoa and Avocado Salad. 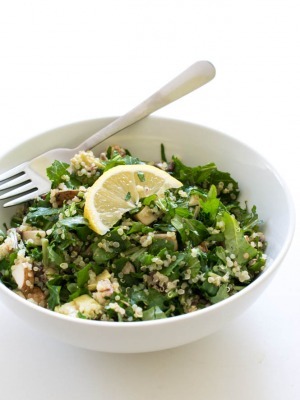 The crunch of the kale and the protein from the quinoa make this the perfect healthy lunch or light dinner. This vegetarian salad is loaded with tons of vegetables. Kale, cherry tomatoes, cucumber and red onion. 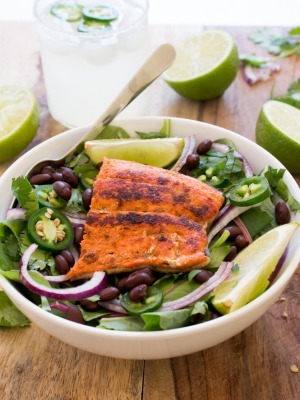 The salad gets drizzled with fresh lemon juice and extra virgin olive oil. This salad takes less than 30 minutes to put together from start to finish. 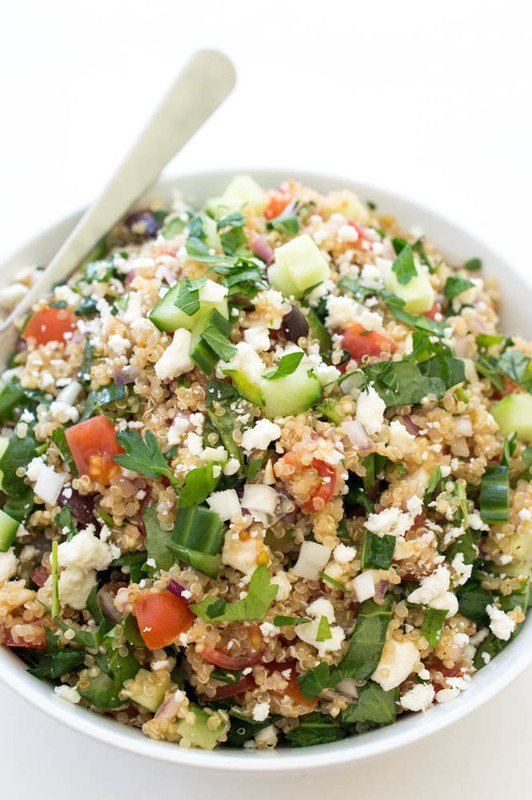 All the flavors of a Greek Salad you love with quinoa and kale for added health benefits. Kale is loaded with protein and is full of essential vitamins and minerals. 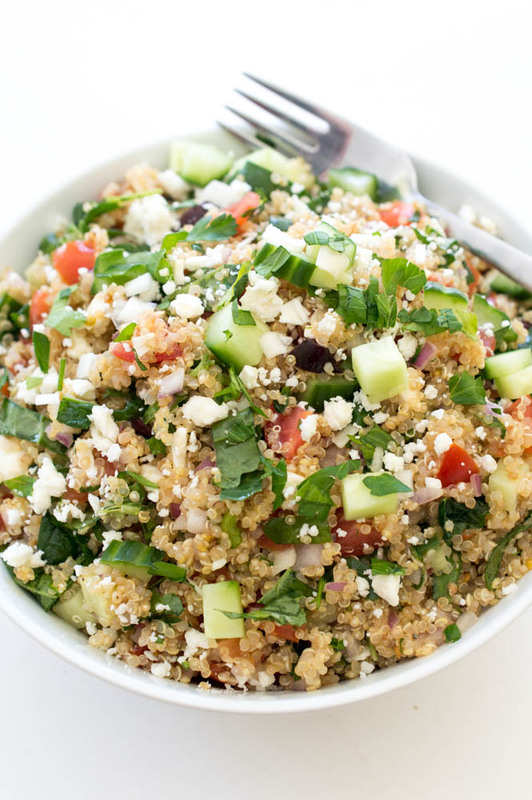 Quinoa is high in fiber and protein. 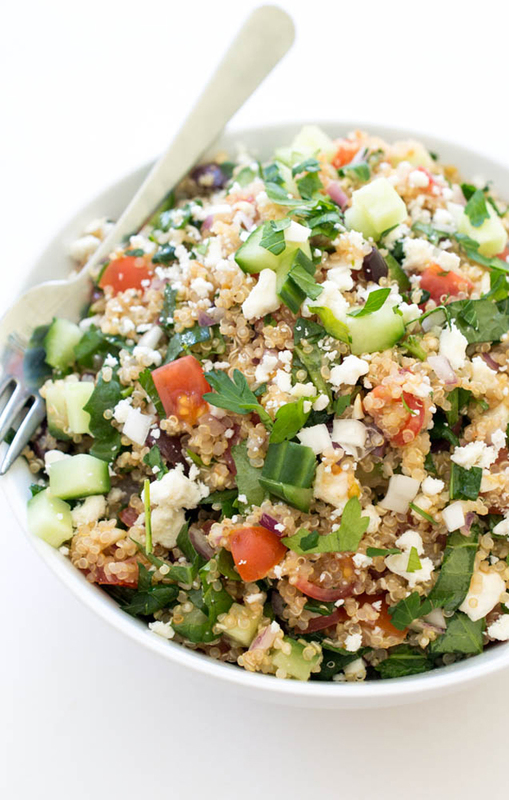 This Greek Kale Quinoa Salad is light and fresh. It would make a great dish for meatless Monday! While the quinoa is cooking I like to chop up all of my vegetables. Toss everything together and serve. Red quinoa can be substituted in this recipe. It would go perfectly in this colorful salad. Add water and quinoa to a medium saucepan. Bring to a boil and reduce the heat to a simmer. Cook until all of the liquid is absorbed, about 15 minutes. Meanwhile add the rest of the ingredients to a medium bowl. Toss in cooked quinoa. Serve immediately with a sprinkle of feta cheese or refrigerate until ready to serve. The picture of the Greek kale quinoa salad looks like it has cucumber and feta in it but they aren’t listed in the ingredients. How much of each did you use? Looking forward to trying this recipe! You are absolutely right. Sorry about that. I will add them in to the recipe now. There should be 1/2 cup of cucumber (diced) and I just add a sprinkle of feta at the end. You can do this to taste. Just made this, currently eating it! It is AMAZING! Definitely going to become a stand-by 🙂 thank you!! 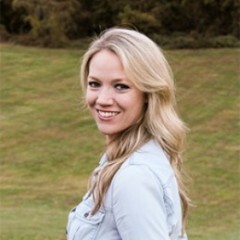 So glad you like it Brittany!! There is no way to print out the recipe with the image unfortunately. I use a separate plugin to generate the recipe formatting and card so I am limited with the changes I can make. I hope you enjoy the salad! I am doing a 6 week 20 pound weight loss challenge and had to modify the recipe. No oil, no cheese and no olives. So I lost the “greek” part of the salad. I added a bit of garlic powder, paprika and added a touch of cayenne. I can’t wait to come home and have some more with my dinner. Super yummy!!!! Once I am able to add back in the feta I will be in heaven:) Thanks for giving me a yummy way to add kale to my diet. So glad you enjoyed it! Thank you! I made this for an extended family bbq, and everyone loved it! I made it exactly per the recipe, and will make again and again. I will make this for myself to have on hand for healthy lunches. Thanks! This is an awesome and easy recipe! I have made it a few times already and have also added grilled chicken and shrimp, which makes this even tastier. Do you have the nutritional information? My wife hates tomatoes so we left those off, but it was still great. I mixed za’atar, oregano, and garlic in with the quinoa and it really helped it to be a little less bland. Yum!